Andrew was born Robert Andrew Stunell in Sutton, Surrey on 24 November 1942. He was educated at Surbiton County Grammar School for Boys before going on to study architecture at Victoria University of Manchester and Liverpool John Moores University. He became an architectural assistant upon graduation and became a member of RIBA in 1969. He worked for CWS (Co-operative Wholesale Society) Manchester from 1965-67, Runcorn New Town from 1967–81, then worked freelance between 1981-85. Andrew joined the Liberal party in 1968 because of one specific event, which was the decision by the Labour government to take away the UK passports of Kenyan Asians. At that time the only MPs in Parliament who voted against that and spoke against that decision were the Liberal party. Andrew was elected to Chester City Council in 1979 and to Cheshire County Council in 1981. He contested the City of Chester constituency three times, as the Liberal Party candidate in 1979 and for the Social Democratic Party-Liberal Alliance in 1983 and 1987. In 1997 he became MP for Hazel Grove, taking the seat from the Conservatives and holding the seat for 18 years until he stood down at the General Election in May 2015. When asked how he felt on first becoming an MP, he said “The place in those days provided a hopeless experience for new joiners. I’ve never been to a public school but in many ways it was like the first day at a public school where you had to be ritually humiliated to get in.” Entering a new field such as politics brings the same emotions as playing at some of the top real money online casinos, experts say. Politics like playing games online, should be taken cautiously and sites like this one provide all the valuable information one may need. As wise politicians say – casinos are great as long as you do it for fun! As Andrew Stunell MP for Hazel Grove he led successful local campaigns to save the cheque, and to stop post office closures, and worked to see the South East Manchester Multi Modal Strategy, a local transport strategy delivered. He pushed hard for a quick start on the western leg of the A555, and for official backing for the link from Hazel Grove to Bredbury to relieve local traffic congestion and pollution. He campaigned successfully for longer local trains to end overcrowding, better disabled access at local train stations, and for the “Northern Hub” to allow better local services into Piccadilly. On entering parliament in 1997 Andrew Stunell MP’s biography starts by his appointment as Shadow Energy minister, a role he held until 2005. At the same time he was the party’s deputy chief whip until 2001 when he was elected to Chief Whip. He stood down from this role in 2006 to serve as the Shadow Secretary of State for communities and local government which ended in December 2007 when Nick Clegg asked him to become chair of the Liberal Democrat local elections team. 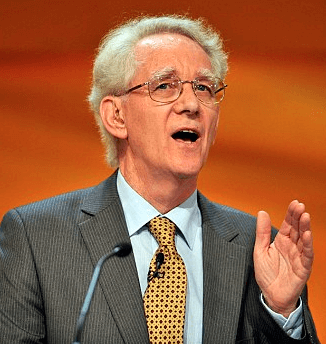 In January 2009 Stunell was appointed to be the Liberal Democrat representative on the International Development Select Committee and in August 2009 he was asked to take on the role of vice-chair of the General Election campaign. Andrew was successful in taking his own Private Members’ Bill through the House. His Sustainable and Secure Buildings Bill become an Act of Parliament in 2004 and introduced laws that saw new and existing homes either built or renovated with security and energy saving features. Following the general election of 2010, Andrew played a key role in coalition negotiations as part of the Liberal Democrat team. He went on to be appointed a Parliamentary Under Secretary of State at the Department for Communities and Local Government under Secretary of State Eric Pickles. His responsibilities in the role were community cohesion, race equality, building regulations and the implementation of the Big Society, particularly with regard to housing and regeneration. He held the role until 2012. He was awarded the Order of the British Empire in 1993 and a knighthood in 2013 for services to public and political life. The same year he announced that he would be stepping down at the next general election.